She was born and raised in Buenos Aires. She is a lawyer and was a teacher at Buenos Aires University. She has been involved in the world of photography since 1984. She is a photographer, curator, art dealer, teacher and she has been taking care of the photography cultural management for 20 years. As a photographer she has joined numerous exhibitions and she has presented her work at the Modern Museum of Art (MAMBA), the Recoleta Cultural Center in Buenos Aires, National Exhibition Halls ( Palais de Glace), Sívori Museum and San Martin Cultural Center. She has presented her work in 21 cities in Argentina and abroad in countries such as Chile, Brazil, Mexico, USA, Spain, Portugal, France, Italy, Belgium and Korea among others. Her work is included in the permanent collection of the Buenos Aires city Community, the Fine Arts National Museum in Buenos Aires (MNBA), the Fine Arts Museum in Rio Gallegos, the Plastic Arts Museum of Olavarria, the “Biblioteque National” in Paris, the Fine Arts Museum in Houston, Texas, the Photography Museum in Charleroi, Belgium and in private collections in USA, Europe and Latin America. In 1987 as a teacher and organizer she founded the Argentinean School of Photography which she is still running and that has been ranked as the first educational center for the broadcasting of the photography in Argentina. The school´s headquarters is in Buenos Aires and has branches in the Argentinean cities of Cordoba, Mendoza, Salta, Ushuaia as well as in Pilar County. In 1989 she launched the “Encuentros Abiertos de Fotografia”. Since 2000 they are associated to “Festival of Light”, an international cooperation between 20 festivals of photography from the 5 cotinents, helping to give greater visibility to argentinean photography in the world. She is the coordinator of Festival of Light International since 2008. In 1999 the “Fundación Luz Austral”, which she still manages, was created to promote photography by organizing events called ¨Encuentros Abiertos¨, editing books and catalogues as well as caretaking and organizing exhibitions inside the country and abroad. In 2000 she worked as a consultant for the Secretary of Culture in Buenos Aires. In 2001 she was entitled consultant in the photography area for the Argentinean Foreign Office Department of Culture. In 2005 and 2006 she was a curator of the Photo Gallery in the Buenos Aires French Alliance and the exhibitions in the San Martin Cultural Center. In 2005 she was also a teacher for the CFI (Investment Federal Board). The same year being a Panasonic culture consultant, she developed the travelling Panasonic Art Collection called “Argentinean sights”. She is consulted by the Photographic Resource Center of Boston University, the Guggenheim Award, FOAM Photography Museum of Amsterdam, and other international institutions in her capacity as an expert in photography. In April 2008 she gave a lectured about “Women, Art and Technology” invited by the University of North Texas. She has been a Member of the International Advisory Committee during ¨Mois Photo¨ in Paris 2004, 2006 and 2008. She also participated in the Board of the First Latin American Photography Auction to Benefit EMA, that took place in Malba (2010/09/08). She participates in several art fairs as an artist and art dealer. She participates also as a jury of international photographic competitions (Biarritz, France, Bamako-Mali), as well as in national competions (National Hall), provincial (San Juan Salons, Paraná, Salta, Patagonia, Santa Cruz, Jujuy), municipal (Transparesencia-Buenos Aires) and from private companies (Coca-Cola, Petrobras, Panasonic, ArteEspacio, Book Fair). She supports charities institutions and foundations. 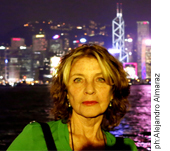 She is invited to photography festivals from all over the world in her capacity as a reviewer of portfolios and panelist on the subject of contemporary Argentinean photography. She continues working in all these activities.